What is the Panaray MB4 modular bass loudspeaker? The 200-watt Panaray MB4 modular bass loudspeaker is for installed and portable use. It has a frequency response of 45 Hz to 310 Hz (+/-3 dB). Rugged portable enclosures, integrated hang points, molded handles and interlocking feet make this ideal for most jobs in which bass reinforcement is required. What does the Panaray MB4 modular bass loudspeaker add to the Bose Professional Systems product line? This loudspeaker provides punchy, deep bass in an affordable, modular package. You can build up the right amount of bass for each project by either stacking the bass units or building bass arrays. Its wide frequency response, up to 310 Hz (+/- 3dB), allows you to cross it over with loudspeakers in the Bose Panaray line, with no holes in the lower mid-range. Does the Panaray MB4 modular bass loudspeaker replace any speaker in the current product line? The Panaray MB4 modular bass loudspeaker is not a replacement for another product. It is a complement to our other bass loudspeakers. What are the main differences between the Panaray MB4 modular bass loudspeaker and other loudspeakers? The Panaray MB4 modular bass loudspeaker is unique because it uses smaller, more efficient drivers to achieve extended low-end and high-impact bass. Its small size and modular design provide incremental bass output to match the amount of bass needed for the mid to high speakers you choose. Is the Panaray MB4 modular bass loudspeaker passively or actively equalized? It requires a crossover with a high pass and low pass filter. We recomment that you high pass the Panaray MB4 speaker at 30 Hz, and low pass it anywhere between 30 and 310 Hz. What brackets are available for the Panaray MB4 modular bass loudspeaker? 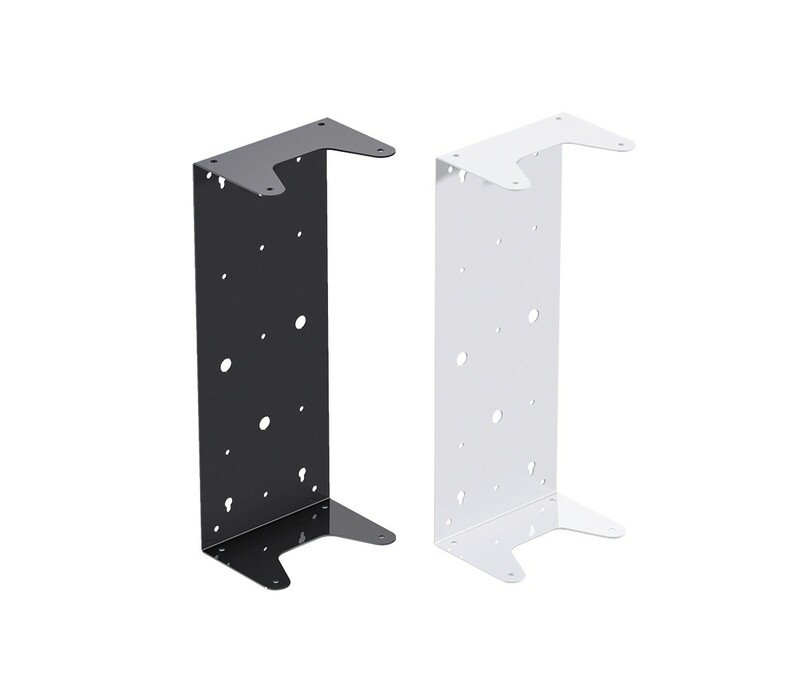 The optional MB4 single-unit, wall-mount bracket is available in either black or white. Can the Panaray MB4 modular bass loudspeaker be used with other Bose loudspeakers? Yes, you can use it with any of our mid/high loudspeakers. How many Panaray MB4 modular bass loudspeakers do I use with Panaray 402, 802 and 502 A speakers, the FreeSpace 3 system, and the LT 9702 loudspeaker? What settings relevant to the Panaray MB4 modular bass loudspeaker are preset in the Panaray system digital controller? The Panaray system digital controller II contains preset equalization curves for all combinations of Bose mid to high loudspeakers when used with the Panaray MB4 speaker or speakers, in stereo or mono. It also has presets needed for endfire and broadside bass arrays. Does the Panaray MB4 modular bass loudspeaker replace the Panaray 502 B bass loudspeaker for all applications? No. When you want non-localizable bass, the Panaray 502 B is still your best solution. Choose the Panaray MB4 speaker when the customer needs low-end response, down to 45 Hz (+/- 3dB), or when you need to crossover above 180 Hz. How is the Panaray MB4 modular bass loudspeaker different from other Bose bass loudspeakers? The Panaray MB4 modular bass loudspeaker is less powerful than one Panaray MB24 and one Panaray MB12 loudspeaker, or one Panaray 502B loudspeaker, and it provides more bass power than the FreeSpace 3 bass module. The Panaray MB4 speaker has extended low-end bass response down to 45 Hz (+/- 3dB) for systems in which deep bass is a requirement. With the upper-end response to 310 Hz (+/- 3dB), you get accurate transient response for clear, rich bass. This wide-range response provides smooth bass augmentation for all Bose mid to high loudspeakers. Can I use the Panaray MB4 modular bass loudspeaker in a 70V or 100V system? No. The Panaray MB4 loudspeaker is an 8-ohm product and does not have a transformer option. How many drivers are there in a Panaray MB4 modular bass loudspeaker? Each one contains four 5.25" (133 mm) drivers. It is not recommended for installation outdoors. What happens when I stack Panaray MB4 modular bass loudspeakers? Every time you double the number of Panaray MB4 bass units in a stack, you increase the bass output by 6 dB-SPL. What crossover frequency should I use when using the Panaray MB4 modular bass loudspeaker with Bose mid/high loudspeakers? Using the Panaray system digital controller II, choose the correct preset for any combination of Panaray MB4 and Bose mid to high speakers. High pass as low as 30 Hz and low pass between 30 Hz and 310 Hz. How should the Panaray MB4 modular bass loudspeaker be placed in a room? You can place it anywhere in a room. For increased bass output, place it in a corner or against the wall for boundary loading. Due to the wide frequency range of thie loudspeaker, the low end will be localizable, so take care to place it in close proximity to the mid to high sources. If you want bass that is less localizable, cross over the bass at the lowest frequency in the Panaray system digital controller II, which is 100 Hz. Can I recess a Panaray MB4 modular bass loudspeaker in the wall or floor? Yes, as long as the full front grille is open to the room. What colors are available for the Panaray MB4 modular bass loudspeaker? It is available in black or white. What connectors are on Panaray MB4 modular bass loudspeakers? This loudspeaker comes with two NL4 Neutrik Speakon connectors. How do I daisy chain Panaray MB4 modular bass loudspeakers? The connectors on the back of the loudspeaker are parallel. You can go into one and out of the other as needed. Keep in mind that as you do this, your impedance is cut in half. For example, MB4 at 8 ohms plus MB4 at 8 ohms will yield 4 ohms impedance. Can I use Panaray MB4 modular bass loudspeakers with mid to high speakers from other manufacturers? What is the warranty on the Panaray MB4 modular bass loudspeaker? As with all Bose professional loudspeakers, the Panaray MB4 modular bass loudspeaker is covered by a five-year limited warranty that is fully transferable. What is a bass array? Any traditional low-frequency loudspeaker provides omni-directional bass. When you combine multiple bass loudspeakers with electronics, you can manipulate the bass energy to create directional bass. Why is directional bass desirable? Directional bass allows you to keep the bass energy where the audience is, and away from potential problem areas. Hard reflective surfaces and domes can degrade intelligibility and clarity in a sound system installation. You can use bass arrays in the same way you use focused mid to high speakers such as those in the Bose LT product family. What bass array configurations does Bose offer? The Panaray system digital controller II has three bass array configurations preprogrammed for the Panaray MB4 loudspeaker. It features the 2X and 4X enfire arrays, along with the 2X broadside array. What is a Panaray MB4 modular bass loudspeaker endfire array? An endfire array combines exact spacing of Panaray MB4 modular bass loudspeakers with a preset in the Panaray system digital controller II to create bass energy that fires out of one end of the array and is greatly reduced (by up to -15 dB) at the opposite end. The Panaray MB4 loudspeaker can be used in a two-unit (2X) or four-unit (4X) endfire array using the correct number of loudspeakers and the Panaray system digital controller. What is a Panaray MB4 modular bass loudspeaker broadside array? A broadside array results from the exact placement of Panaray MB4 modular bass loudspeakers and the Panaray system digital controller II to create bass energy in the shape of a ring of sound encircling the speakers with greatly reduced bass energy on the top and bottom of the broadside array. How do I build a bass array? To create a bass array, you will need the correct number of Panaray MB4 speakers, the Panaray system digital controller II and the spacing bracket that's apporpriate for the bass array you wish to set up. When would I use a bass array? Use bass arrays for any situation in which you want to direct the bass energy. For example: an endfire array would be used in a theater, where the goal is to direct the energy off the stage and onto the audience. Similarly, you could use a broadside array in a school gymnasium to direct bass energy onto the audience and off the playing area. Why no three-box endfire bass array for the Panaray MB4 modular bass loudspeaker? The performance difference between two- and three-bass units was not sufficient to warrant production of a 3X endfire array system. Would the spacing rules for endfire and broadside arrays be the same if I use the Panaray 502 B loudspeaker instead of the Panaray MB4 bass unit? No, the spacing and presets would be different. The bass array settings for the Panaray MB4 apply only to that loudspeaker. Can I make bass arrays with Panaray 502 B and FreeSpace 3 bass modules? Yes, but you'll need the help of a Bose field engineer. Presets for these arrays are not available in the Panaray system digital controller II at this time. When would I need a custom bass array instead of the three Bose provides? You might need a custom bass array for the Panaray MB4 loudspeaker when you want to control dispersion differently from the endfire or broadside pattern, or when you need an endfire or broadside array that is larger than the ones we provide.